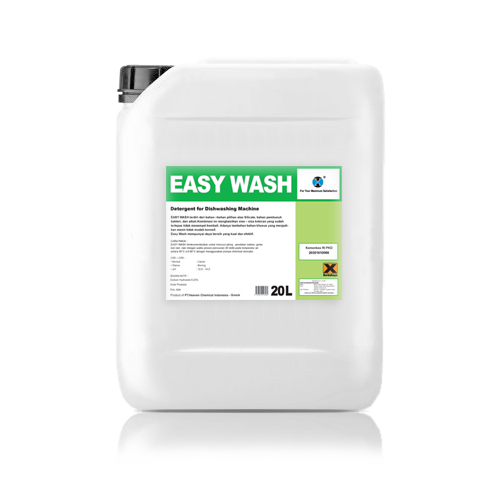 EASY WASH is synthesized on a base of silicates, disinfecting, active agent, special sequestering and alkalis. The combination of active agents keeps the soil in the washing machine solution in a dispersion to the resetting of leftover. Therefore, food particles are prevented. Special additive extensively protects machine parts and the good being washed from corrosion. The optimal combination of the individual components is the basis for the intensive cleaning power and effective disinfection. Thoroughly and gently cleans dishes, utensils, glasses. Germicidal effect through recognized disinfecting active level. EASY WASH is highly recommended to be used for dishes, utensils and glassware during the wash cycle for at least 20 seconds at 55°C – 60°C done by specially made automatic dispenser. EASY RINSE is a liquid blend of surfactant, organic acids and polymers effecting a clear drying of dishes and utensils leaving them sparkling clear. The surfactants are biodegradable and give a quality result at a minimum usage levels. The blend of organic acid and polymers maintains thin result in hard water areas as well as keeping the rinse free from scale and excessive formation of foam that could impair the entire washing process. Automatically dries dishes, glasses, and other kitchen utensils. Fully effective even in hard water. EASY RINSE be operated by PT. HEAVEN CHEMICAL INDONESIA automatic dispenser system. TWINKLE is formulated to clean up and sanitized for cutleries, silverware, and pot & pan. As a guideline, TWINKLE is used at : Dosage : 4 – 10 gram per 1 ltr water, at an optimal temperature of 35°C – 70°C. 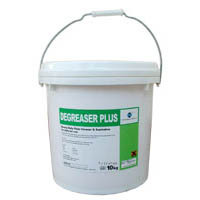 As a guideline, DEGREASER PLUS is used at : Dosage : 3 – 10 gram per 1 ltr water, at an optimal temperature use warm water. 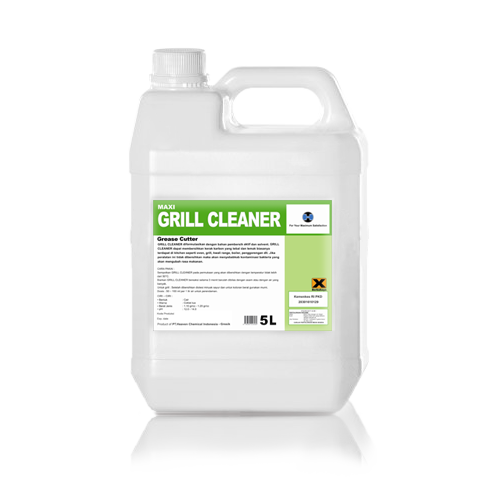 GRILL CLEANER is formulated using a combination of powerful cleaning agents and solvents. GRILL CLEANER is able to remove tough baked-on oils and grease commonly found on kitchen equipment such as grills, ovens, kwali-range, boilers, fryer etc. If not removed such baked on soil may cause bacteria contamination and will alter the taste of your food. 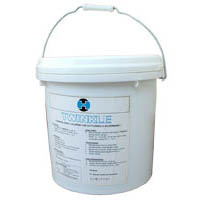 Safe to use on all stainless steel , porcelain and glass surfaces. 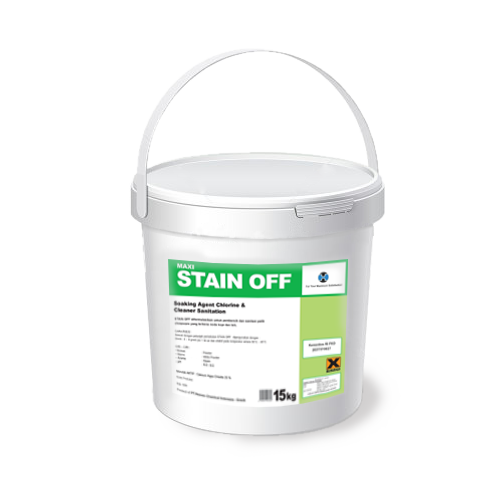 STAIN OFF is formulated to clean up and sanitized for chinaware from coffee and tea stain. Completely miscible in cold and hot water. Able to function in all water conditions. As a guideline, STAIN OFF is used at : Dosage : 4 – 8 gram per 1 ltr water, at an optimal temperature of 30°C – 45°C. CHARITY – Formulated from a synthetic blend of non-ionic surfactant, CHARITY is a thick viscous detergent which can be used in a multitude of uses. In the kitchen, CHARITY makes for an ideal pot & pan cleaner, while in food processing plants, CHARITY ability to emulsify and remove oils and grease makes for an effective equipment cleaner. Being neutral in pH, CHARITY is safe on hands and all hard surfaces.CHARITY – Formulated from a synthetic blend of non-ionic surfactant, CHARITY is a thick viscous detergent which can be used in a multitude of uses. In the kitchen, CHARITY makes for an ideal pot & pan cleaner, while in food processing plants, CHARITY ability to emulsify and remove oils and grease makes for an effective equipment cleaner. Being neutral in pH, CHARITY is safe on hands and all hard surfaces. Effective oil / grease removing properties. Safe on all surfaces, including aluminum and marble. 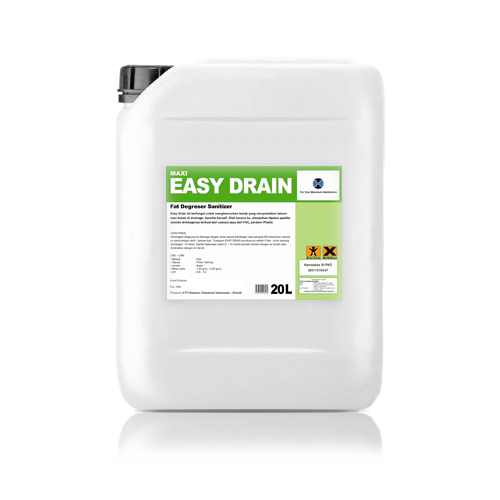 EASY DRAIN This chemical has a function to destroy fat that blocked the drainage, this chemical may cause a corrosion that’s why is not recommended if the drainage is made from a cement and only recommended if the drainage is made from PVC or plastic. Pour directly into the drainage with a dosage that is suitable with the length of the drainage till the grease trap. Pour directly EASY DRAIN about 5 liters for 10 meters length, and wait for (5 – 10 minutes) then rinse with water for neutralizing. PROTEGE is designed as a heavy duty multifunctional product. Used in the kitchen as a descaling liquid for the Dish Washing Machine, PROTEGE is able to rapidly remove lime and scale build-up and restore the stainless steel metal to its original shine.